TIKAPUR, March 11: The increasing pollution in various rivers and streams of Tikapur has threatened the aquatic life there. This has even led to the disappearance of some rare aquatic species. The polluted water has especially challenged the survival of amphibians and reptiles such as dolphins, crocodiles and various species of fish. During a program conducted by a drinking water project on Saturday, the stakeholders pointed out that the irrational human activities have resulted in increased pollution. Excessive use of chemicals for fishing and farming has made the river water toxic for the water animals. Besides that, the contaminated water released from the sewage has further harmed the life under water. The polluted water has not just damaged the health of the dolphins but has also killed hundreds of fishes which are their food. According to conservationist Tharka Bahadur Sah, the number of fish has decreased significantly in Karnali, Mohana and other big rivers in recent days. "The increasing water pollution has killed a large number of fish and now the number of dolphins and crocodiles has also started decreasing," informed Thapa. According to him, the immediate solution for this is controlling fishing at least for next three months. He informed Republica that it will be better to ban fishing from April to June, the fertilization season for fishes. The stakeholders also expressed their disappointment towards the District Coordination Committee (DCC) for allowing fishing in the rivers. According to them, the chemical used by the contractors to kill the fish has invited further problems. 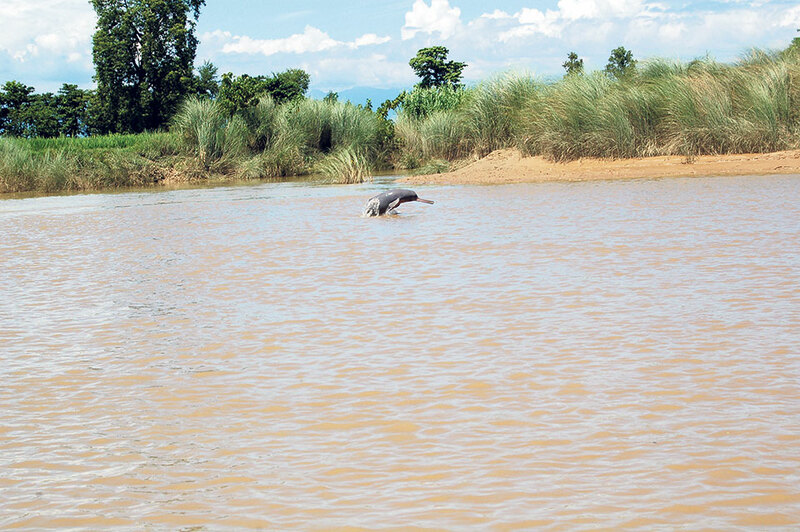 Bijayraj Shrestha, who has long contributed to the conservation of dolphins stressed that the DCC needs to be serious about the conservation of dolphins. "It is not right to put the lives of the endangered species at risk just for the temptation of few rupees," said Shrestha, adding, "They are our assets and it's our responsibility to conserve them." Surya Bahadur Thapa, coordinator of DCC, Kailali, assured the stakeholders that all the fishing contracts of major rivers will be cancelled. Not just that, he also said that the DCC will make efforts to convince the provincial government to formulate a law for the conservation of dolphins. There are more than 100 rivers and streams in Kailali.